Each year, Brown puts on a Theories in Action conference to showcase research done by graduating seniors. Students from all fields are welcome to apply. The conference is supposed to be fairly high-level and focuses more on the research process than mathematical methods or detailed results. At first, I struggled to find a way to present my senior thesis research to this audience. How can could I explain research that had complex background in biology and statistics at a higher level? I was reading a new paper on Hi-C  when the answer came to me. The authors of this paper included a “paperflick,” a short movie that explained their research to a more general audience using animation. Visit the paper at Cell and watch the video on the right side of the page. This was an excellent way to communicate the main conclusions of the paper and make them accessible to someone without a huge amount of background knowledge. I decided to make my poster a narrative about “Cellular DNA as a bundle of yarn.” My method, MonteGrappa, was an attempt to uncover the underlying 3D yarn structure from 2D data. I made a poster focusing around this narrative and even glued and painted yarn at various points! This is what the poster looked like finished. The narrative was a great way to get the research across to people who had never heard of chromatin structure before, and everyone was surprised to learn that you have 2m of DNA in each cell! 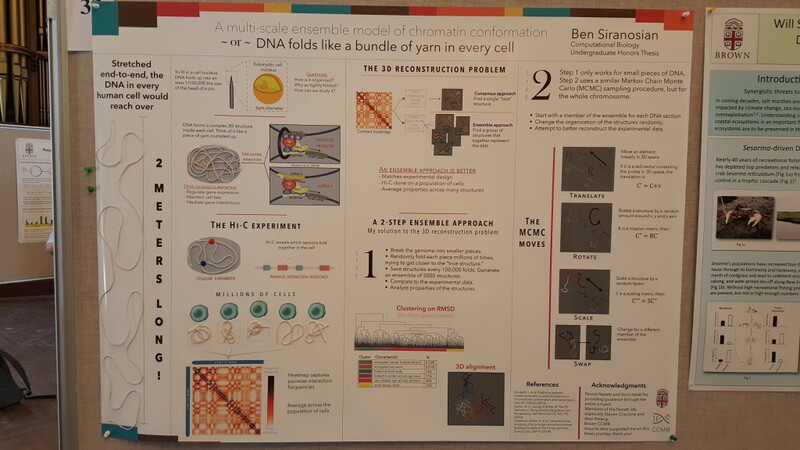 To view the poster in higher resolution (without the yarn attached, of course, check out the PDF below.